The mailman brought me a small package this week, book-sized, postmarked and with a return address from the town in which I grew up, Hettinger, North Dakota. Isn’t that wonderful, and just truly amazing? Her name in high school was Valerie Lindquist, and I think she was a year ahead of me in school. He brother Ron and I used to play sandlot baseball. He was a year younger than me, I think. We all moved away from Hettinger after high school, and our paths have not crossed since, more than 50 years. 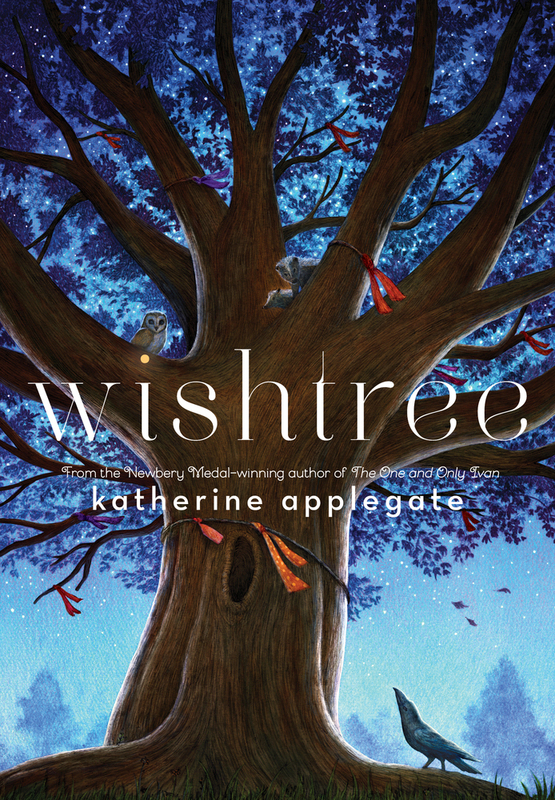 The book is titled “wishtree,” one word, small letters, and written by the noted children’s author Katherine Applegate, who’s had a number of children’s books on the New York Times best seller list. This is a good one. And it’s beautifully illustrated by children’s book illustrator Charles Santoso. You’ll like the art, too. It’s a delightful story about Red, the talking Red Oak tree. Actually, it’s a story BY Red, the talking Red Oak tree, a story of Red’s history, told by Red himself, a wise 200-year-old resident tree in a small town somewhere in America. But Red is not just a tree, he tells us. He’s a home, a community. At any given time, his branches, leaves, roots and hollows are home to all manner of wild critters, all friends—crows, salt-and-pepper chickadees, raccoons, foxes, opossums, mice, skunks, porcupines, woodpeckers . . . The book tells the story of Red’s newest friend, a little girl named Samar, whose Muslim family has moved into the neighborhood, and is shunned by the other residents. 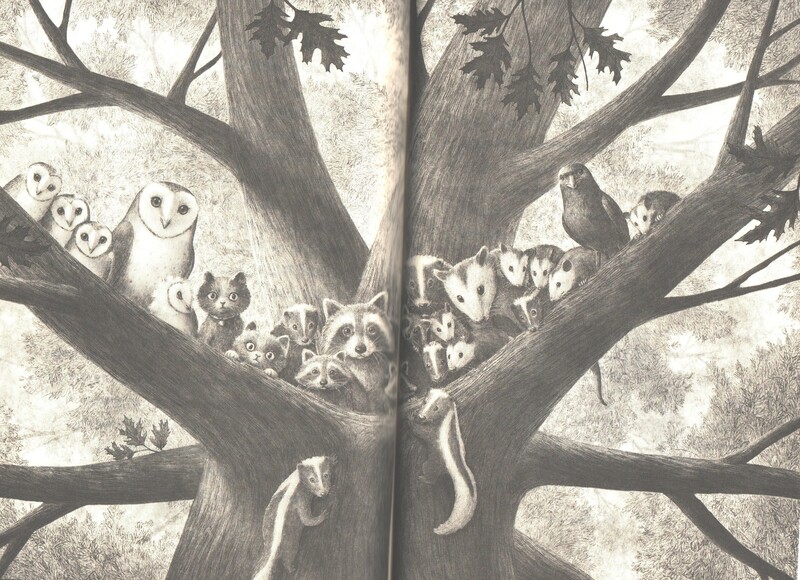 Late at night, Samar would come to visit Red, to snuggle up against his sturdy roots, and soon all the residents of Red’s leaves, branches, hollows, and roots came to know her as a friend. Samar has the look of someone who has seen too much. Someone who wants the world to quiet itself. She moved with her parents into one of the houses I shade, a tiny blue house with a sagging porch and a tidy garden. She is perhaps ten years old or so, with wary eyes and a shy smile. Samar would venture out in her pajamas and robe and sit beneath me on an old blanket, spattered with moonlight. Her silence was so complete, her gentleness so apparent, that the residents would crawl from their nests of thistledown and dandelion fluff to join her. They seemed to accept her as one of their own. If this were a fairy tale, I would tell you there was something magical about Samar. That she cast a spell on the animals, perhaps. Animals don’t just leave their nests and burrows willingly. They are afraid of people, with good reason. But this isn’t a fairy tale, and there was no spell. And then we learn that Red is a Wishtree. Wishtrees have a long and honorable history, going back centuries. There are many in Ireland, where they are usually hawthorns or the occasional ash tree. But you can find wishtrees all over the world. For the most part, people are kind when they visit me. They seem to understand that a tight knot might keep me from growing the way I need to grow. They are gentle with my new leaves, careful with my exposed roots. After people write their hope on a rag or piece of paper, they tie it onto one of my branches. Usually they whisper the wish aloud. It’s traditional to wish on the first of May, but people stop by throughout the year. I wish for a flying skateboard. I wish for a world without war. I wish for a week without clouds. I wish for an A on my geography test. I wish Ms. Gentonini weren’t so grumpy in the morning. I wish my gerbil could talk. I wish my dad could get better. I wish I weren’t hungry sometimes. I wish I weren’t so lonely. So many wishes. Grand and goofy, selfish and sweet. And then Red tells us the story of Samar. One night, not long ago, Samar came out to visit. It was two in the morning. Late, even for her. She had been crying. Her cheeks were damp. She leaned against me, and her tears were like hot rain. In her hand was a small piece of cloth. Pink, with little dots. Something was written on it. A wish. The first wish I’d seen in months. I wasn’t surprised she knew about the wishtree tradition. I’m kind of a local celebrity. Samar reached up, gently pulled down my lowest branch, and tied the fabric in a loose knot. I’m not going to tell you the rest of the story, other than it is timely. I want you to read it yourself. And then read it to your children, and grandchildren. It’s a magical story, and it was the magic of my having grown up in a small North Dakota town, where these kind of things happen, that brought me this story, from an old acquaintance who read a story about our big, state champion Red Oak tree, and thought I would like this book. Well, she was right. I wish that she will come and visit us, and our tree, on May Day, or any other day. I want to get reacquainted with this thoughtful person who was kind enough to send this book. And as for our North Dakota State Champion Red Oak tree, well, I suppose it needs a name, and I suppose Red is as good as any. Actually, the book’s Red tells us that all Red Oak trees are named Red. So that’s it, I guess. 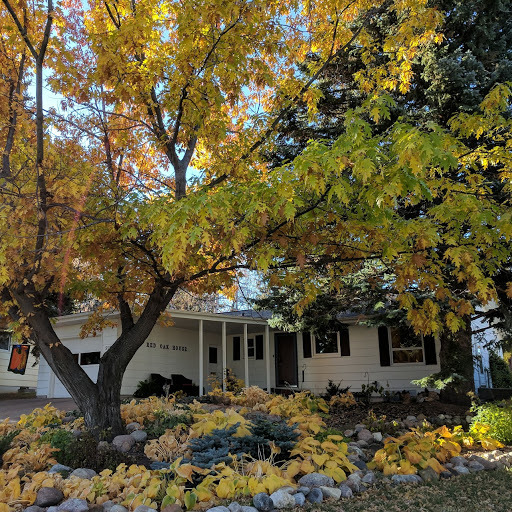 If you don’t know about our tree, you can read about it here. If I thought it was a Wishing Tree, I, too, would probably wish for a new friend. Actually, that wish has already been granted. Thank you, Valerie Lindquist Braun. Lovely story. Thanks, Jim, for writing this piece and thanks to Valerie Lindquist Braun for inspiring it. Jim, keep writing. It brings joy to my life!